When it comes to the worship of God, it is not just a matter of us talking, praying, and singing to God; instead, worship is to be a conversation between God and his people. There is to be a dialogue in which we hear from God, and engage him in return. Worship, then, is hearing God’s revelation and then responding to him in praise, devotion, and obedience. The term “liturgy” describes what we do in worship. Liturgy is a Greek term that means “the work of the people.” Every church has a liturgy. Liturgy is not only a reference to more traditional forms of worship. Contemporary styled worship may have less liturgical elements to it, but it still has a liturgy of several praise and worship choruses (in which the people know when to stand and sit), and an extended time of preaching. God is always the initiator of salvation and worship. If it were not for God himself approaching us, most fully expressed in Christ’s incarnation of coming to this earth, then we have no hope. Since humanity is in the vice grip of sin, it takes someone outside of us to help us. So, when we begin a worship service, it is God himself who initiates the conversation, through the call to worship. 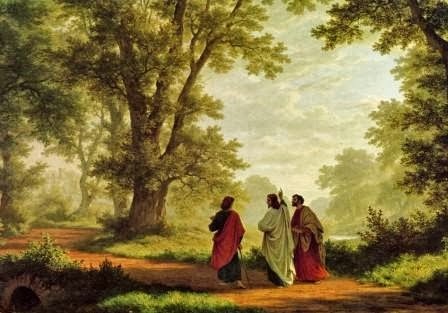 When the two men on the Emmaus road met Jesus after his resurrection, he engaged them in the Scriptures (Luke 24:13-27). He went to the Old Testament and explained to the two men what it had to say about the Christ. They heard from God. If we want to understand Holy Scripture, we must also walk with Jesus and converse with him. A worship liturgy exists in order to promote a relationship between us and God. The reason we do what we do liturgically is to create space whereby God and God’s people can be in a meaningful conversation with each other. This means that we must listen well. We cannot listen well to God if we are crazy busy and have our minds and hearts engaged in all the things we believe we need to do. Sometimes we make our lives overwhelmingly busy so that we either cannot or do not have time to listen to God. We actually might create noise and desire busyness because we are much too uncomfortable with silence, and aren’t sure if we really want to hear what is in our hearts. Getting to the place of resting enough to listen can seem, for some, like a daunting task. This is not a plea to do more, but to do less so that God’s people can have a conversation with Jesus. A good place to begin is to practice the Sabbath, and use the day, not just the morning, to connect with God. In this liturgical rhythm, this conversation between us and God, the good news of Jesus is presented. God first acts by seeking and desiring fellowship with us; God sent his Son, the living Word, to restore the fractured relationship – Jesus is the divine Word who has accomplished the restoration between us and God. This revelation, this realization of what God has done for us in Christ requires a response from us. When we enter a church, we are called by God to worship him; we respond by praising him for wanting fellowship with us. Having glimpsed how holy God is, it makes us realize how sinful we are, and, so we confess our sins to him. God, in his grace, forgives us our sin and assures us of our pardon. In our thankfulness for that grace, we joyfully listen and live according to his Word. And, so, back and forth we go, with the liturgy proclaiming the gospel to us in a divine dialogue that blesses both us and God. If you think about it, all of life is liturgical. We each have routines, habits, and life patterns that shape how we get things done. When my wife and I were married, we experienced a clash of liturgies. Her family had their ways of doing things, and my family had theirs. I quickly learned what a proper liturgy for folding towels was. Worship liturgy is not just for Sunday morning. We can intentionally build some spiritual rhythms and spiritual conversation throughout each day. Our daily call to worship is when we wake up, realizing that we have been called into wakefulness to enter into praise for a new day. As we go through our day we can recognize sin when it happens, and be quick to confess it and accept God’s forgiveness. We can be intentional about hearing from God, by creating space and setting aside time for reading Scripture. When our heads hit the pillow at night, we receive the blessing of God in sleep, until a new day begins. Whatever way we go about it, we are to develop spiritual habits of approaching God, listening to God, and responding to God. Christianity is not just a system of beliefs, but is a way of life. The kind of habits that we develop in that life will determine what kind of disciples we will be. So, we must choose well the kinds of routines that we need in order to walk well with Jesus and carry on a conversation with him.